It is one of the only 225 GS Carrera coupés built. The Porsche 356 was first produced by Austrian company Porsche Konstruktionen GesmbH (1948-1949) and then by German company Dr. Ing. h. c. F. Porsche GmbH (1950-1965). 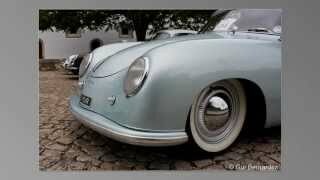 The 356 was created by Ferdinand "Ferry" Porsche. Like the Volkswagen Beetle designed by his father Ferdinand Porsche Sr., the 356 is a four-cylinder, air-cooled, rear-engine, rear-wheel drive car with unitized pan and body construction. The chassis was designed completely new as well as the body, which was designed by Porsche employee Erwin Komenda, while some mechanical components including the engine case and some suspension components were based on and initially sourced from Volkswagen. When Porsche moved to Stuttgart, it marked the beginning of a close working relationship with the nearby Reutter coachworks - to become the main supplier of Porsche bodies for nearly two decades, before being annexed into the Porsche organization. In order to distinguish between the major revisions of the model, the 356s are usually classified into a few large groups. The 356 was built in four distinct series, the original 356 (also called "pre-A"), built through 1955 are easily identifiable by their split (1948 to 1952) or bent (centre-creased, 1953 to 1955) windscreens. In late 1955 the 356 A appeared, with a curved windshield and with several small but important improvements. Its internal factory designation, "Technical Programme 1", gave rise to its nickname "T1". In early 1957 a second revision of the 356 A was introduced, known as T2. In late 1959, the T5 356 B appeared; followed by the redesigned T6 series 356 B in 1962. The final version was the 356 C, little changed from the late T6 B cars but disc brakes replaced the drums. All 356 generations were also available in an open-top version (Cabriolet, Speedster or Convertible D). In 1954 a small team in Zuffenhausen, a Stuttgart suburb, led by Ernst Fuhrmann began a new, pure Porsche engine. Designated the Type 547, it had dual overhead camshafts, chrome-lined cylinder liners, dual Solex carburetors, 39 degree valve included angle, 48mm intake and 41mm exhaust valves, a roller bearing crankshaft, dry sump lubrication, dual ignition and an extremely over-square 1.288:1 ratio of bore to stroke, 85x66mm.These engines were fitted to a revised 550 chassis with Erwin Komenda-designed bodywork. With the Type 356A in 1955, Fuhrmann took into consideration, the engine space of the 356 in designing the 547 four-cam engine. Four-cam engines had been circulating around Zuffenhausen since 1954 in the works’ engineering test car and in Ferry Porsche’s cabriolet. The Porsche 550 Spyder had taken convincing class victories in 1952, 1953, and 1954 at the Carrera Panamericana. The race contributed its name to the new engine. At the Frankfurt Show in September 1955 the new 356A Porsche was joined on the stand by a ‘Carrera’ Porsche with a modified four-cam engine designated 547/1. The four-cam "Carrera" engine, initially available only in the 550 race cars, became an extra cost option starting with the 356 A, and was available through the 356 model run. At full chat the 1498cc engine could reach speeds of almost 120 mph and was capable of 100 bhp, which was more than enough for the 356A’s 820 kilogram kerb weight and remarkable feat in the 1950s. Produced in limited quantities for just four years, chassis 56778 was coachwork by Reutter and it is one of the only 225 GS Carrera coupés built.